Want to run away from the "real' world and live on an island off the coast of Maine? Well, Eva Murray will show you that life on Matinicus is very real, and she'll do this with insight, compassion, feistiness, and just the right amount of humor. Reading this book is almost as much fun as driving the ferry!" "As a First Class ship pilot (any tonnage) for nearly thirty years, I had a lot of contact with people on Matinicus Island, where we had a pilot station. I have wished for some time that someone would write a descriptive story about Matinicus and its people. Mission accomplished with Eva Murray's book "Well Out to Sea." "What's it like to live on an island twenty-two miles out to sea, where there are only three dozen winter residents? Where the local economy is lobstering...period? Where your most reliable source of transportation off the island may be a small Cessna and the airstrip is dirt (or snow or mud)? Where, if the forecaster says the storm is "headed safely out to sea," you know it's coming your way? 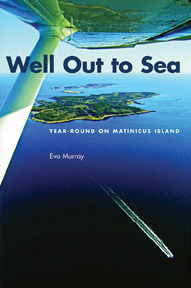 Eva Murray moved to Matinicus in 1987 to teach in its one-room school. Over the years she's written a number of lively columns and articles for mainland publications. These are the stories of a unique community, of an interdependence that is all too rare these days but necessary for this island's survival. Murray writes with a keen eye and sharp wit, sharing stories that are sometimes poignant, sometimes mind-boggling, and often hilarious. She lives in a place where, 'You love it, absolutely love it here, 51 percent of the time. That is enough to make you stay'."